Loren Janes was born in 1931 in Sierra Madre, CA, and has lived his entire life in Southern California. He was a lifeguard on the beach and performed in a water show with performances from Monterey to San Francisco. He joined the Marines during the Korean War and served under Lt. Gen. “Chesty” Puller. After his discharge he spent 2 years teaching 11th and 12th grade math and science in a private school. In 1954 Loren became a professional movie stuntman making a big splash on his debut—an 80 foot dive off a cliff at Catalina Island for Esther Williams’ “Jupiter’s Darling”. In the following years, Loren worked with practically every major director and producer. Loren doubled Steve McQueen for 23 years starting with “Wanted Dead or Alive”. Eventually racking up over 500 film jobs and 1,000 television shows, just a few films he worked on are “Flaming Star”, “Spartacus”, “Snow White and the Three Stooges”, “Magnificent Seven”, “How the West Was Won” (watch for his famous “cactus jump” as he leaps from a train traveling about 30 mph and hits a cactus), “Sons of Katie Elder”, “North To Alaska”, “McLintock”, “Nevada Smith”, “Planet of the Apes”, “Good Guys and the Bad Guys”, “Paint Your Wagon”, “Blazing Saddles”, “Goin’ South”, “Butch and Sundance: The Early Days”, “Halloween 3”, “Beverly Hills Cop”, “Rambo 2”, “Casino” etc. 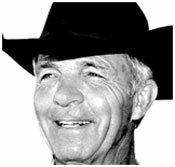 For TV, besides “Wanted…”, there was “Cisco Kid”, “F.B.I.”, “Kentucky Jones” and “The Rifleman” among others. In ‘61, Loren was co-founder of the Stuntmen’s Association of Motion Pictures, the first stuntmen’s organization. He also found time to serve on the Board of Directors of the Screen Actors Guild in ‘92, and was National Chair of the Screen Actors Guild Stunt and Safety Committee. Since the early ‘50s Loren has been speaking on the principles of the United States Constitution to clubs and organizations all over America. During this time, he even ran (unsuccessfully) for U. S. Congress two times. 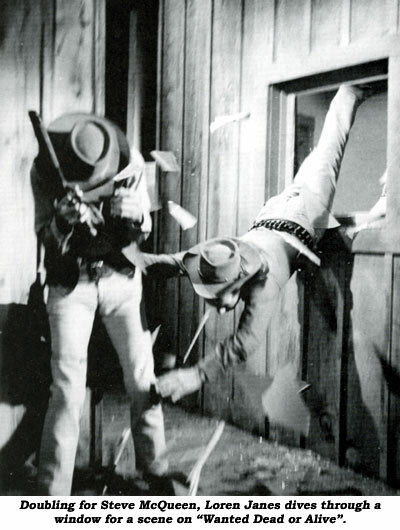 Loren filmed a lot of behind the scenes action on his many film jobs around the world and became a lecturer in ‘61 showing his film “Behind the Action” to audiences young and old, especially at the annual Lone Pine Film Festival. Loren’s still active after almost a 50 year career. As a member of the Stuntman’s Association with Loren, he is one of the members I looked up to during my career.